The Maui News / CHRIS SUGIDONO photo Lahainaluna’s Reece Pascua goes up for a shot against Maui High’s Fransver Castro in the first quarter. 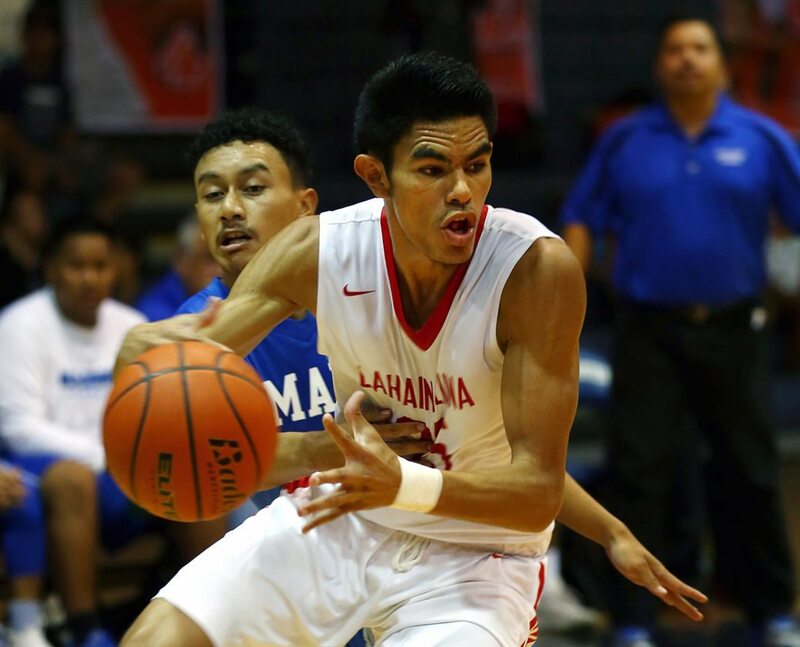 LAHAINA — Things started slowly for the Lahainaluna High School boys basketball team on Thursday night at the Lahaina Civic Center — in more ways than one. The Lunas (8-0) still managed to beat Maui High 62-34 to clinch the Maui Interscholastic League regular-season title and a fifth straight state berth. They won their 32nd MIL game in a row and improved to 49-1 in league play under fourth-year coach Jason Justus. If there was any doubt that it was the Lunas’ night in front of a packed house at the LCC, it faded when Iverson Turno hit a running 35-footer at the buzzer to give the home team a 30-18 lead at halftime. 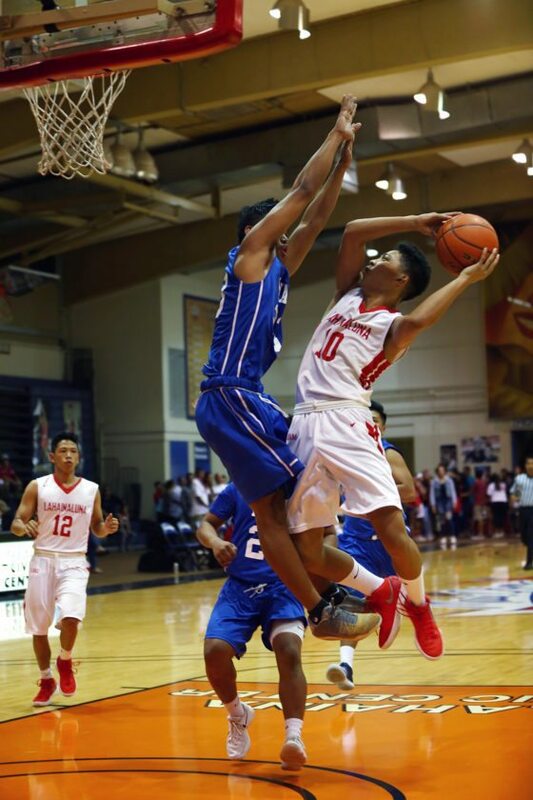 Koa Evalu-Robinson had 11 points and eight rebounds, while Isaiah Tanner added 10 points — nine Lunas scored in the game. A West Maui Youth Basketball League doubleheader was previously scheduled at the LCC, forcing the girls game to start late on their senior night in a packed gym. The Lahainaluna boys game started about 30 minutes late after the girls game ended and six seniors took their final shots. The Lunas boys did not score for nearly 4 1/2 minutes, tying the game 3-3 on a C.J. Palma 3-pointer from the left-hand corner in front of the school band. The Sabers regained the lead, 5-4, on a midrange jumper bu Jojo Pacubas midway through the first quarter, but the Lunas took the lead for good when Aukai Kama scored inside with 2:57 left in the first quarter. From there, they quickly took control, upping the lead to 25-11 on a steal and breakaway layup by Kama with 4:45 to go in the first half. A baseline runner by Reece Pascua made it 46-23 with 1:47 to go in the third quarter. The Sabers (5-4) are still in second place in the MIL with three games to play. Pacubas led Maui High with 11 points. 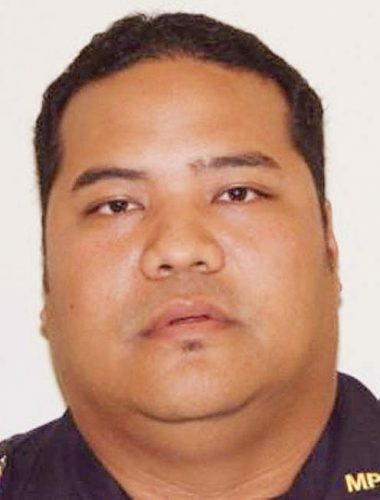 “Tonight we couldn’t handle their physicality, they killed us on the inside and the boards, and with them we can’t make mistakes like that,” Maui High coach Steven Vega said. “On the offensive end, they got us playing out farther than we normally like to play and we couldn’t match it. Efren Villon 8, DJ Sable 0, Rexie Butihi Jr. 0, Jojo Pacubas 11, Brycetyn Boco 2, Chey Higashiguchi 0, Fransver Castro 0, Michael Villon 0, Kevin Cacho 0, Keoki Agtaguem 2, Jayden Ramos 5, Kea Aguirre 6, Scott Magno 0. Reece Pascua 7, Iverson Turno 5, Malino Jacinto 0, Kuikawa Ross 0, Isaiah Tanner 10, Tre Rickard 5, Cley Josef Palma 8, Carter Stockham 5, Siale Hafoka 3, Aukai Kama 8, Hunter Higdin 0, Koa Evalu Robinson 11. 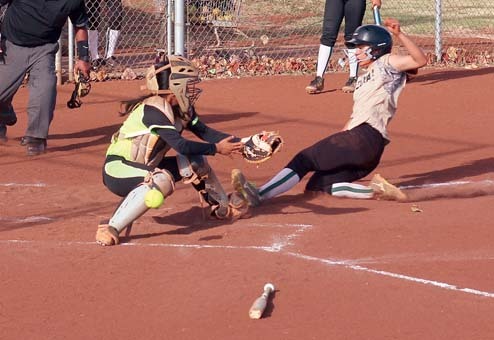 Hana at Seabury Hall, 7 p.m.
St. Anthony at Lanai, 7 p.m.
Haleakala Waldorf vs. Molokai at Eddie Tam Gym, 7 p.m.
Hana at Seabury Hall, 10 a.m.
St. Anthony at Lanai, 11 a.m.